Back in 1974 or 5, I was a professor at William Paterson College, had divorced Fred Mollenkott, and was living with my son Paul and my then-partner in Hewitt, New Jersey. A friend and former student who was working at Harlem Valley State Hospital was given, by her colleague Ken Wapnick, a mimeographed copy (in three paperback volumes) of something called A Course in Miracles. Ruth procured another copy for me and I began studying it that very day. Now, forty-some years later, Suzannah and I read from ACIM every day along with singing inclusive-language hymns, reflecting on biblical truths, and praying together. We ignore the Course's exclusively masculine language, change all the pronouns for God and people to "she," and proceed happily on our feminist studies. During my first readings of ACIM, I experienced a lot of cognitive resistance. I was not pleased to learn that the Course was dictated "by Jesus" to a Jewish psychologist named Helen Schucman, transcribed by fellow psychologist William Thetford, and edited by Jewish psychologist Ken Wapnick. I had nothing against Jews or psychologists, but I was still fundamentalist enough to be frightened by the thought of someone channeling a voice that claimed to be Jesus, the Jesus of the Gospels. However, I had read many mystics by then, and I decided to enact what I had learned from them: if teachings are respectful of others and conducive to kindness and peace, then their source is not as important as their effects. I began to practice the principles of the Course in order to see what happened. The first indication that I was on the right track came to me in a Mother's Day card from my son, who was about 16 at the time. I had never mentioned embarking on a new self-study course, but this is what he wrote: "Dear Mother: I am so proud of you, the way you are learning to love!" In a way it was embarrassing to be congratulated by a teen-ager for "learning to love," but it was also proof that under the guidance of the Holy Spirit some of my inner blockages to love were being removed. The Course told me that I did not need to do anything except offer my "little willingness" to the Spirit -- and apparently the process was underway! Some years later, a similar but opposite result occurred. My son seemed to me very ungrateful for what I did for him; and instead of confronting him, I asked the Holy Spirit to take care of it for me. Within a month or two, without a word from me, a most amazing conversion occurred: Paul began to express profound gratitude and has continued to do so. Wow! 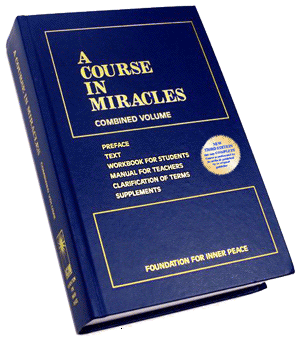 After ACIM's official publication in 1976 (with the first single-volume hardback publication in 1985), the Course now exists in over 2.5 million copies and is studied in 24 different languages, with 8 new translations underway. There have been litigations over copyrights and disputes among some of its most outstanding teachers. Some Christians have claimed that the Course is demonic, but many others have recognized its healing beauty. If anyone is interested in all these disputations, they are readily available on the Internet. But I am so keenly aware of all the disputes about Bible translations and biblical interpretations that I am not bothered by the similar tempests that surround A Course in Miracles. It has made me a kinder, more understanding person than I formerly was. It has quieted many of my fears and has taught me to turn to my silent center whenever I am feeling distressed. It has set me free to teach only Love. In fact, according to the Course, Love is the central lesson of Jesus' crucifixion: "Teach only Love, for that is what you are." Before studying ACIM, I would have been afraid to tell gay men who enjoyed one-night stands that God loves them just the way they are. True. John McNeill, a Jesuit psychologist, had told me that I should never put down anybody's attempts to relate. But before ACIM I would have been too scared of God's judgment to follow McNeill's wise counsel. The Course teaches that the Last Judgment will be that there is no judgment, only forgiving all-inclusive divine love. And that freed me to love my son just as he is and everybody else just as they are. I know, I know: people who are intimately acquainted with me can no doubt point out places where I have fallen short of extending unconditional love. But I am a work in progress, and forgiving myself is a vital step toward forgiving others. What I would really enjoy is interacting with people online who are willing to think about Course principles and discuss them in depth. Including the resistance they may feel to some of these principles. Take, for instance, the basic premises of A Course in Miracles: "Nothing real can be threatened. Nothing unreal exists. Herein lies the peace of God." How does that statement sound to you in our post-Holocaust, violent world? Clearly it implies that the world of time and space, and our separate bodies, are not ultimately real, so that nothing can harm the reality of our internal selves. If you would be willing to probe your own response to that principle and write out your experience with it, I'd love to interact with you in the comments on Christian Feminism Today. My website administrator, Marg Herder, who also administers the Christian Feminism Today website, assures me that people seldom enter into profound interaction in the comment sections of articles, so perhaps my hope is useless. If so, that's okay too. At least I have taken this opportunity to tell you what silenced the guilt and consequent judgmentalism I was taught as a young fundamentalist Christian. The word miracles in A Course in Miracles refers simply to a change in perception, not to miraculously healing the sick or raising the dead. But in fact my changes in perception did heal my sickness of self-hatred and separation. And they did raise me from the deadness of valuing my own "rightness" at the expense of other peoples' "wrongness." Are you up for miracles? Do you have any perception you would be willing to see transformed? © 2014 by EEWC-Christian Feminism Today. All rights reserved, reprinted by permission.